Printed onto canvas, varnished and stretched onto a 1.5" gallery ready frame. 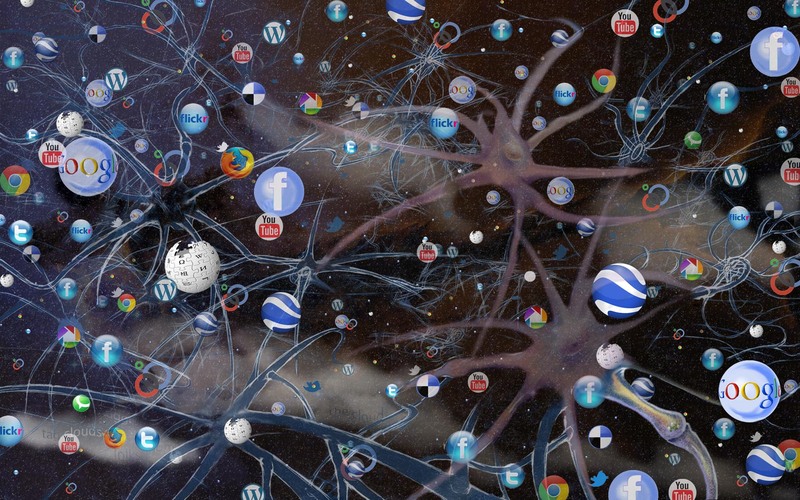 "This image combined multiple digital layers including the original pencil sketch of brain neurons, synaptic gap, starry night, Web 2.0 icons, clouds and text, using Adobe PhotoShop layering capacities. I called the process of creating a bricolage or collage using digital technologies, digitage. This image was published in the journal Communications of the ACM (CACM) as an illustration for an article in their April 2013 issue titled "The Evolution of Web Development for Mobile Devices." "Logos from Web 2.0 are caught in the web somewhere a starry night, clouds, science fiction landscapes of our inner space, the synapses of the brain, the virtual space that is not abstract, imagined or really real. Tim O'Reilly, 2005. "What Is Web 2.0: Design Patterns and Business Models for the Next Generation of Software". Uploaded 09/30/2005. Accessed January 6, 2007.